The Three Kings Charcoal is considered to be the original quicklighting Hookah Charcoal Brand on the market. Three Kings proudly introduces their version of the ring shaped charcoal with this new brand of Three Kings Rings Charcoal. - The Ring Coal design allows for air flow through the coal, keeping the coal lit throughout the entire smoking session. 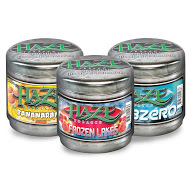 - Ring Shaped Hookah Coals offer more surface area, allowing for more efficient combustion. - Ring Coals burn slightly warmer than most other quick lighting hookah coals on the market, allowing less charcoal per session. Ring Coals also complement the Vortex and Phunnel Bowls very well, as they do not offer direct heat over the center spire. These Charcoals Rings are manufactured in Holland, and are specifically designed for smoking with the Hookah. The Three Kings Rings Charcoals are known for their quality since they are odorless, as well as tasteless and do not interfere with flavor of the tobacco. 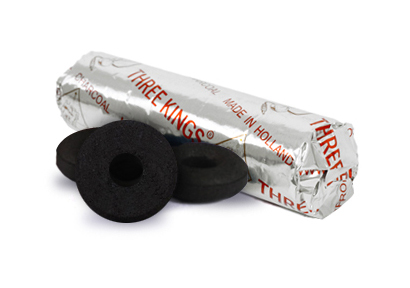 Each roll of Three Kings Rings Charcoal contains ten individual charcoals. 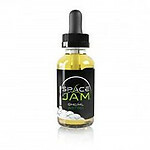 It is recommended that three rolls of Charcoals be purchased for every 250g Box of Flavored Tobacco.